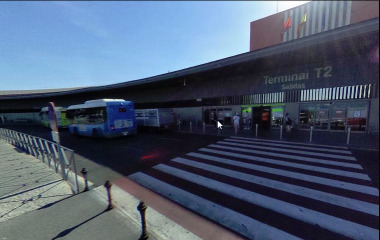 Outdoor parking for short, medium and long stays in the Adolfo Suarez - Madrid Barajas airport. Leave your vehicle at the terminal departures area T2, where an accredited (ID card) and uniformed driver (black blazer, blue shirt, yellow tie and black trousers) will be waiting to pick your car up. The car inspection process; the searching and taking photographs of the hits and scratches; and the delivery of the service contract usually takes about 5 minutes. Remember to arrive to the terminal with time enough to hand over the vehicle to the driver before checking in your luggage. You do not need to go to the parking, leave your vehicle at the terminal departures area T2 (mid-terminal, in front of the Fumarola bar). A uniformed driver, who will call the mobile to ask you exactly where you are, will be waiting for you, pick your car up and take it to the parking. All the transfers are FREE.